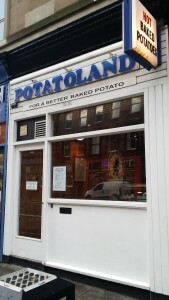 I was labouring under the misapprehension that I’d comprehensively covered the Edinburgh baked potato provision, but my friend Dan not only pointed out that I’d not reviewed Potatoland, he also strongly contended that it was the best tattie place in the city. I had to go exploring and test this out. 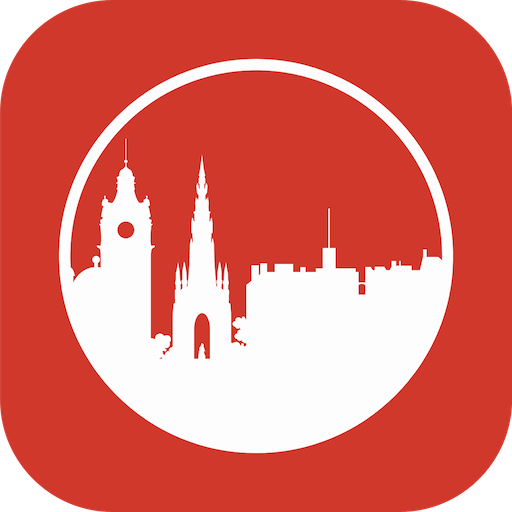 On the main drag of Clerk Street, not far from the likes of The Tartan Stag, The Apiary and Verdo, Potatoland is very well positioned to appeal to the student crowd walking in between Pollock Halls of residence and George Square, and is keenly priced to appeal to that market. The menu is simple and unfussy with a range of hot and cold toppings for the tatties. I chose haggis and cheese, then opted for the garlic butter, as Dan had insisted this was their ace in the hole. I’d assumed I’d take it away, but when it was assembled it looked like a sure-fire tie destroyer, so I opted to sit-in at one of their shelf seats. 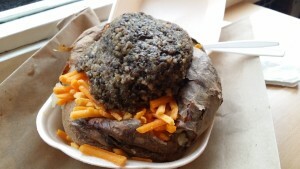 With the topping bursting out of the tattie in all directions, it was hard to know where to start, so I simply attacked it unguardedly. It proved very good eating. Once I’d mined my way through the peppery haggis and melted cheese, I hit the garlic butter. Dan was entirely correct; it was delicious stuff. So overall, I was impressed with Potatoland. Rotato still wins for their skewered crisp skinned beauties, but the topping here was very well done and that garlic butter was quite something. 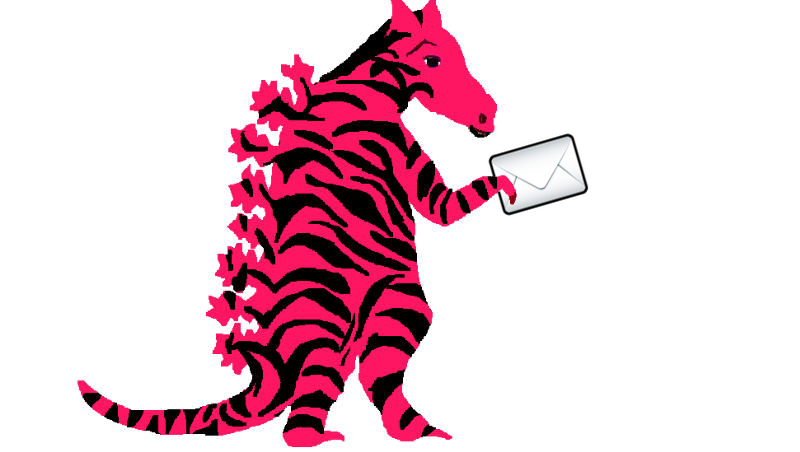 Give it a visit, soon.